Anton Chekhov was born in 1860 in Taganrog, Russia. The son of Pavel and Yevgeniya, the pair ran a grocery store until 1876 when Pavel declared bankruptcy. Sadly, at the young age of 24 Chekhov began to show signs of tuberculosis. On 15 July 1904, he passed away at the age of 44 from the illness in Germany. In 1901 at the age of 41, Chekhov married Olga Knipper – an actress who originated the role of Masha in Three Sisters. The pair were involved in a long distance relationship with Chekhov living in Yalta and Olga in Moscow pursuing her acting career. The marriage ended due to Chekhov’s death only three years later. Over the years, there have been many adaptations and interpretations of Chekhov’s work from the stage to screen, including the critically successful adaptations of The Duel in 2010, Vanya on 42nd Street (based on Uncle Vanya) in 1994, and The Cherry Orchard in 1999. In fact, only Shakespeare outranks Chekhov with the amount of film adaptations of a playwright’s work. 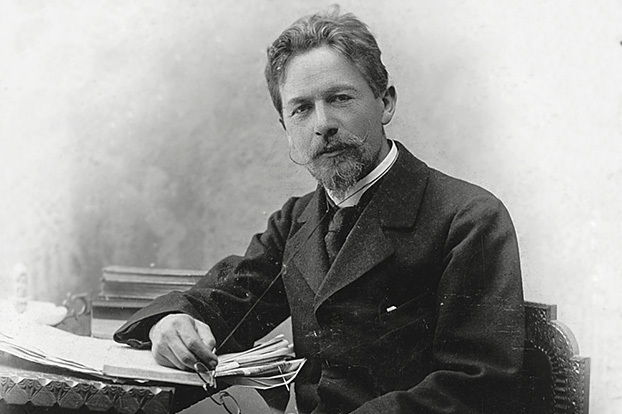 Earlier in his career, Chekhov used different pen-names to publish short stories and humourist pieces. He wrote several short stories under the pseudonym ‘Anton Man Without Spleen’ and others under ‘Antosha Chekhonte’.